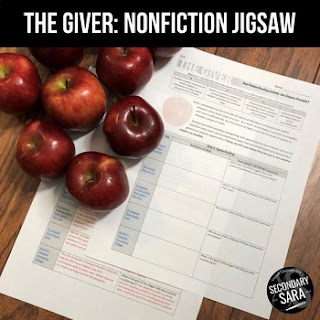 Need to add non-fiction into a unit on The Giver? Want to pull in cross-curricular non-fiction to show utopias (or are they dystopias?) in our modern world? Use this FREE 2-day lesson connecting literature and modern articles to assess CCSS RI.1 and RI.2 in your ELA classroom. Themed around the question “Are Utopias Really Possible?”, the articles and corresponding questions ask students to think critically about human attempts at social perfection and what causes a utopia to fail. Ask students to read all three articles OR assign students to articles (jigsaw-style) to differentiate your instruction. NOTE: The EDITABLE version of this activity can be found in my full The Giver Novel Unit. • Chapter Study Guides: During Reading Activity for ANY novel!